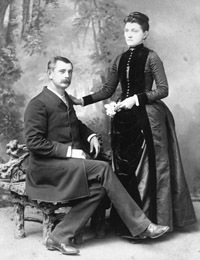 Hugh Ratchford Black and wife Mary Louisa Snoddy Black. Photo courtesy southernspaces.org/Laurel Horton. The Garrisons’ Healthy Families Initiative (1997-2002), named by the Trustees in appreciation for T.R. and Alma Garrison’s generous bequest, challenged nonprofits to address the root causes of poor health by focusing on prenatal and childhood strategies, while including the entire family unit. The Healthy Community Initiative (1998-2003) provided implementation grants to community task forces to address issues identified through the 1997 Spartanburg County Health Assessment, including poor nutrition, cardiovascular disease, teen pregnancy, and illiteracy. In 2003, at the end of the two initiatives and after an 18-month planning process, the Foundation announced its two funding priority areas: Early Childhood Development and Healthy Eating | Active Living. In addition to the two priority areas, the Foundation developed the Community Health Fund. Copyright 2019. Mary Black Foundation.